GRAND RAPIDS February 17, 2015– When the calendar shows February, everyone expects cold temperatures here in west Michigan. But sometimes temperatures drop so low, spending extended periods of time outdoors becomes dangerous. After much consideration and deliberation, the Feeding America food truck scheduled for this Thursday, February 19, at Plymouth United Church of Christ, has been cancelled due to the extreme temperatures that are expected. 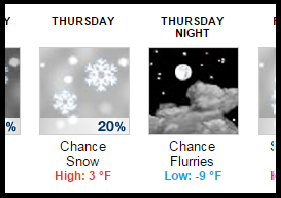 The National Weather Service in Grand Rapids is forecasting a high of 3 on Thursday, and a low of -9. The west Michigan labor community’s next food truck is scheduled for March 19 at St. Mary Magdalen Parish, 1253 52nd St Se in Kentwood. This entry was posted on February 17, 2015 by WMALC in Community service news and tagged church, Feeding America, ibew.